June 2nd is the 153rd day of the year (154th day in leap years) in the Gregorian calendar. There are 212 days remaining until the end of the year. On this page, we have placed information about June 2nd, including famous people born on, historical events that occurred on, holidays and observances that fall on, and astrological connections of, this day. 455 The Vandals enter Rome, and sack the city for two days. 1835 P. T. Barnum and his circus begin their first tour of the United States. 1886 President Grover Cleveland marries Frances Folsom in the White House. 1896 Guglielmo Marconi applies for a patent on his invention of the radio. 1897 Following the erroneous publication of his obituary, Mark Twain is quoted as saying "The reports of my death are greatly exaggerated." 1946 Italy votes in a referendum to become a republic. 1949 Transjordan becomes the Kingdom of Jordan. 1979 Pope John Paul II visits Poland, becoming the first Roman Catholic Pope to visit a Communist country. 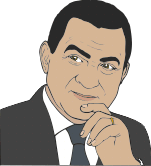 2011 Former President of Egypt Hosni Mubarak is sentenced to life imprisonment.